→How To Increase Vertical Jump Height : Add 10-20 Inches Fast, At Home and Without Weights! How To Increase Vertical Jump Height : Add 10-20 Inches Fast, At Home and Without Weights! 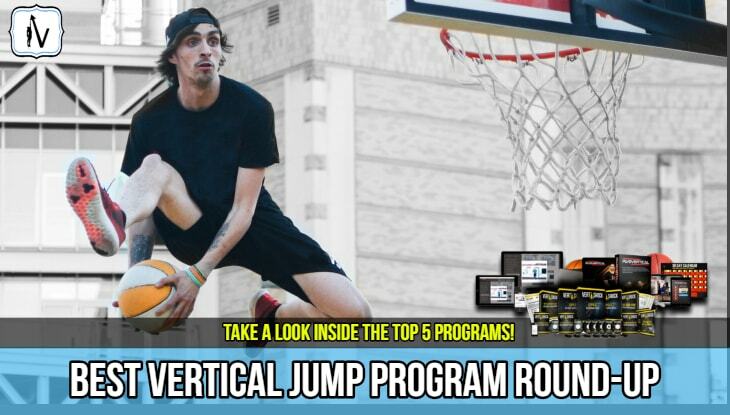 If you want to learn how to increase your vertical jump you Have Come To The Right Place! You Are About To Learn What It Takes To Master The Art Of Vertical Jumping. 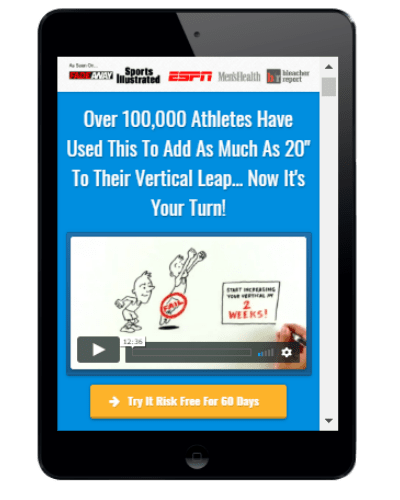 In this post you will learn pro tips and tricks that will help you increase your vertical jump at home fast, with or without the use of weight training. An impressive vertical jumping ability is often the first thing a coach or talent scout will test when trying to determine an athlete’s physical prowess. In fact, an above average vertical jump is an extremely desirable trait for an athlete to possess as it carries over into many sport specific tasks ( eg. volleyball). This is particularly evident in the sport of basketball. A player with a greater jumping ability will usually grab more rebounds, block more shots and of course excite the crowd with their thunderous dunks. The desire to dunk a basketball is probably the number one reason why people embark on their journey of trying to learn how to increase their vertical jump height. Perhaps it is the very reason you are reading this article today? We totally understand why you would want to dunk. Our team here at ﻿﻿﻿﻿﻿﻿Vertical Jump World are OBSESSED with dunking. Nothing in sport can excite the crowd like a spectacular posterizer dunk. As you just saw, Vince Carter's incredible vertical jumping ability allowed him to dominate (and humiliate) his defender by jumping over him. And yes, that defender was 7ft +. Wow! An above par ability to jump high has also provided some memorable moments in other sports. For example the incredible front-flip touchdown by Jerome Simpson. 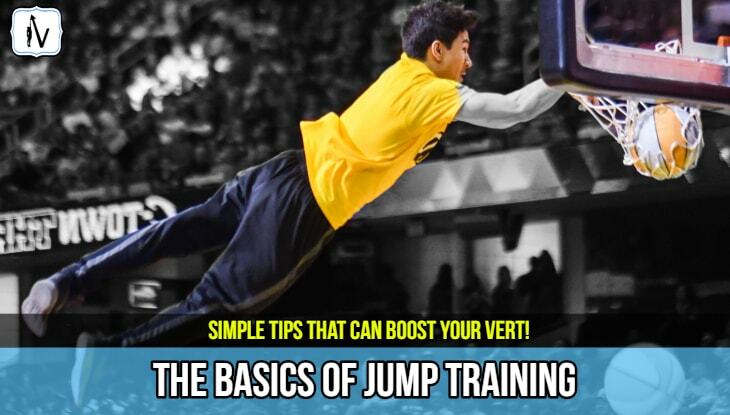 Are There Really “Secret” Exercises That Can Help You Increase Your Vertical Jumping Ability? The Key To Increasing Vertical Jump Height: Exercise With Intent! If you want to stand out in this current era of sport you must be a “high flyer”. The athletes who produce amazing in air plays tend to be the ones who become easy to market to the masses and therefore tend to attract the multi-million dollar endorsement deals. The sports industry has become increasingly more focused on finding ways to increase athletes vertical jumping abilities over the past decade. This interest has also sparked a boom in the industry of vertical jump training equipment and programs. Many of these services are overly hyped with exaggerated claims on the results that they can derive. There are also many jump programs on the market that we believe are poorly designed and super outdated (for example Air Alert). Programs and services like this just complicate the process of learning how to jump higher and often have most athletes spinning their wheels due to the ineffective and outdated training principles. Don’t get me wrong, there are many great vertical jump training programs out there that have proven their worth and can simplify the process of obtaining a higher vertical jump. In this article I will go over some of the fundamental philosophies of vertical jump training. Hopefully the information I am about to share will give you greater insight into what it takes to master the art of jumping higher. In short, no there is no "secret" exercise that can turn you into a “vert freak” like some marketing gurus would like to have you believe. However, there are a few simple mobilization and activation exercises that you can do that can help add a few inches to your jump in a very short period of time. At the end of the day in order to achieve greater vert gains beyond a few inches you will need to commit to a correctly prescribed vertical jump training protocol. Tip: It is very helpful to test your vertical jump so that you have a benchmark from which you can judge your jump gains. There are many phases to vertical jump training that focus on building certain components of an athletes explosive physical properties. There must also be a large emphasis placed on improving the skill of the jump movement itself. Optimal technique must be trained in a sport specific way. This can range from simple movements such as the standing two foot vertical leap to complex movements such as a 360 windmill dunk. To get better at a movement you must train the movement. Sure there are some proven vertical jump training exercises that give a better return on your effort investment than others when it comes to jump gains. reactive abilities of the lower limb muscles and tendons. To make things even more complicated these factors are never prescribed in isolation but instead should be delivered in an evolving periodised program that develops many concurrent aspects of vertical jump development. Yes this process can get quite complex and overwhelming for beginners. This complexity is probably the reason why products such as the all-time best selling jump program The Jump Manual are so popular & effective. 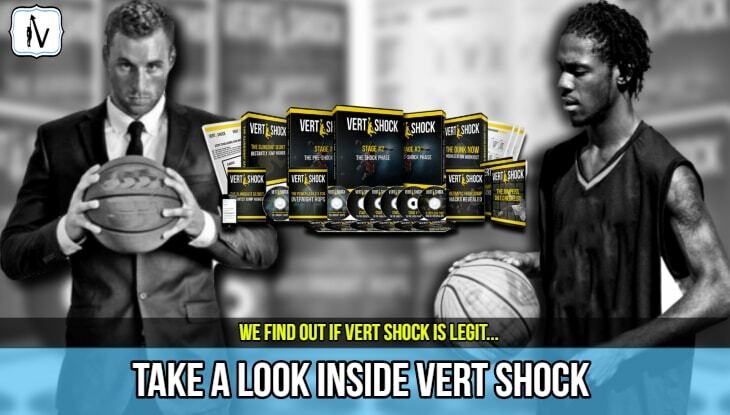 Products like The Jump Manual and Vert Shock (Read >> Vert Shock Review) do a great job of incorporating complex training principles in an easy to follow “done for you” system that is delivered with engaging state of the art technology. Following these types of programs provides a simple step by step blueprint to a higher vertical jump. 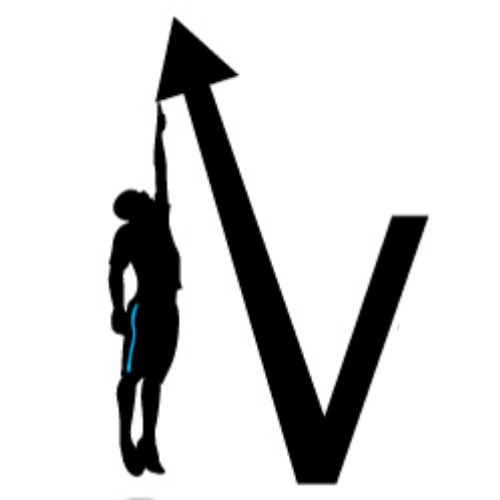 If you don’t feel like learning how to increase your vertical jump height and would just prefer someone to show you how to do it you could always search for a local personal trainer or exercise scientist who is experienced in the field of vertical jump development. An effective trainer or jump program must know exactly when to introduce new exercises or manipulate certain vertical jumping training variables. For example a trainer may introduce a barbell hip thrust to a novice athlete in order to promote gluteal activation and pelvic posture, however once this athlete has reached the appropriate activation level further prescription of this exercise is probably a waste of time. At this point more beneficial exercises must be introduced. Obviously, the less experienced an athlete is the greater the initial gains will be and the less advanced the exercise prescription which will be required. In beginner athletes even simple exercises such as jumping rope will provides a rapid boost in ankle function and stiffness that will help add a few inches to jump height when performed at correct volume and intensity. Body weight exercises such as pistol squats are fantastic exercises that can provide a rapid boost in leg stability and promote muscle synchronization between the muscles of the lower limbs. However, eventually more complex compound movements such as the barbell squat will need to be introduced. Prescription of movements such as the squat is a delicate balance between ensuring optimal safety and pushing the boundaries for optimal strength and power development. The importance of weight training for max vertical jump development should never be overlooked. The creator of The Jump Manual (current rank #1) has collated some his customers most noteworthy testimonials from over the past decade. As you will see there are some very impressive results. The same can be said for plyometric exercises which when correctly prescribed can provide an enormous boost in athletic ability. This is particularly true in those athletes which lack stretch shortening cycle efficiency and general foot strength. However, like heavy load strength training plyometrics also come with an inherent risk of injury. Injuries such as Achilles tendinitis and calf strains are common results of poorly prescribed programs. It is for this reason that we suggest you follow a proven vertical jump program designed by qualified experts. Dynamic exercises such as olympic lifts come with an even greater risk : reward ratio. Olympic lifts are the icing on the cake so to speak and should only be introduced after a strong and stable physical foundation has been developed. Power based exercises can then be introduced help develop dynamic stability and coordination through triple extension of the hips, knees and ankles. If you want to become a much more explosive athlete you must do power lifting! • Specificity of exercises are vital. To get better at vertical jumping one must jump more and undertake regular exercises that emulate the jumping movement. • Strength and rate of force development in the jump specific motor pathways must be prioritized after an initial foundation of stability and mobility has been established. .• Plyometric training and olympic lifts are often incorporated in the last phases of a quality jump program in order to maximise the reactive properties of the muscles and tendons. To increase your vertical jump every movement must be performed with the jump specific intent. When it comes to vertical jump training you must leave your ego at the door. Sure you will get stronger and you may even pack on some muscles or lose some fat. However, don’t ever forget why you are in the gym throwing these weights around. You are there to transform your muscles and tendons into strong reactive springs. Keep your eye on the prize and your passion intact. Looking at these benefits you can see that vertical jump training can have many benefits beyond the realm of vertical jumping. Besides improved health and fitness a participant following a well prescribed jump training program will become an all-round better athlete. In fact, the vertical jump is the go to test for professional combine testing as it gives an excellent representation of an athletes overall athleticism. Studies have shown that an improved vertical can also carry over to improved sprint speed and long jump. As far as vertical jumping goes, athletes with an impressive squat to body-weight ratio will jump higher than weaker athletes, all other factors (height, weight etc) being the same. Yes, genetics play a large role in how an athlete excels at jump specific training. Athletes who are genetically strong and explosive find that they gravitate toward resistance based exercises easier. Some of us just have to work a little harder. But we all can get better at vertical jumping. The beauty of athletic training is that very few athletes ever reach their genetic potential. Yes even the pros. With correctly prescribed jump training principles the human potential for strength and power gains is continually adjusted. Basically, with a correctly prescribed program vert gains are relatively limitless. It all comes down to correct manipulation of the aforementioned training principles. Obviously the rate of gains decreases over time. But for you beginners this is great news as you will get huge gains in strength and jump height over just a few months. In fact the leading jump programs have continuously demonstrated that their participants can increase their vertical jump height somewhere in the range of 8- 24 inches in only 8-12 weeks. Some people have added an incredible 20 + inches to their vertical jump. Of course additional inches can be gained after the initial few months of training however the gains will not be as significant. However every inch counts right? Too often we hear stories of novice athletes who have injured themselves while embarking on their journey to a higher vertical jump. If you are trying to get better at vertical jumping for sport specific reasons then the last thing you want to do is get injured and miss out on a large portion of the season. With the abundance of unorganized vertical jump training advice on the web and YouTube it is very easy for beginners to get lured into the novelty of following these “secret” exercises . It must be said, the most important aspect of achieving an impressive vertical jump is not necessarily the exercises but more importantly the precise prescription and evolution of the exercises. Isolation of the exercises are relatively useless and will lead to less than desirable results. Even though some of the best vertical jump programs will set you back at least $30, they take the guesswork out of the complex jump training prescription. However, if you do decide to put your own program together please ensure that you take the time to learn the fundamentals of vertical jumping and the proper principles of correct exercise prescription. Let’s be honest every athlete has a weakness. Even the pros. We commonly find that the primary deficiency in athletes of intermediate ability is not insufficient power, but rather poor single foot function and inability to effectively transfer force through the core musculature. Some athletes may lack strength and others will lack re-activeness. This fact is common knowledge and can be corrected by following the correct program. However, one topic that many people fail to focus on is that of poor foot function. You see wearing shoes most of the time tends to be counterproductive to development of fast reactive feet. The soft cushioning of the shoe can inhibit neurons at the base of the foot. Less active neurons means less muscle recruitment and you guessed it …a lower vertical jump height. To get better at vertical jumping an athlete must improve their ability to direct pressure to the big toe. This leads to a more powerful ankle extension (plantar flexion) and a more explosive take-off. PRO TIP: Lift weights & undertake low impact plyometric exercises while wearing Vibram 5 Fingers shoes in order to maximise the kinetic chain stimuli from the toe through to calf musculature. These are the sort of cool little tricks that can make all the difference to your overall vertical jump max. Many programs often overlook these aspects of vertical jump development. 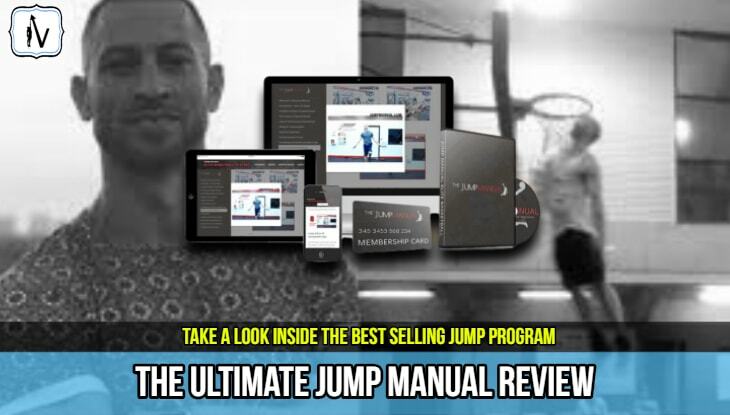 However, programs like the Jump Manual (current rank #1) have done an excellent job of integrating the finer details and complexities of jump training without making the program dull and difficult to follow. If you want to learn how to increase your vertical jump you must invest time into learning the fundamentals of shock training with shock jumps. Any jump program worth it’s grain of salt should include a depth jump component. In fact some programs are designed primarily around the concept of shock training. For example the super popular Vert Shock program is a body-weight only jump program that only uses “shock training” methods to get results. Warning: Be cautious when looking up shock training on YouTube as we are yet to find a video that prescribes the correct protocol that leads to significant increases in vertical jumping height. • Minimal emphasis on landing softness. • No emphasis on foot positioning and how to correctly absorb energy through the right areas of the foot. • No emphasis on maximal effort. The importance of maximal effort is VITAL! I am a huge believer in maximal effort depth and box jumping for vertical jump development. I find that using an overhead target can help ensure continuous maximal effort. Don’t just go through the motions and don’t make it a cardio workout. Depth jumping, when done correctly can produce outstanding improvements in vertical jumping outcomes. 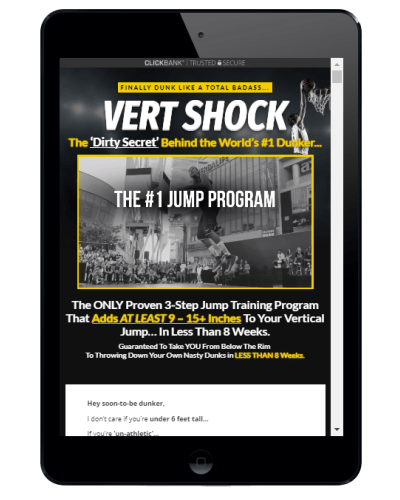 In fact, the Vert Shock program which does not emphasis any heavy weight training is allowing it’s participants to produce some unbelievable gains in their jump height over a very short period of time (check out our Vert Shock Review to learn more). The highest vertical jumpers all seem to jump with so much ease right. Their smooth movements are a thing of sporting beauty. They take off with style and grace and land quietly. This may seem natural but like everything else involved with jump training these aspects must be learnt and perfected. This is something that is easy to say, but rarely put into practice. Basically to become a more efficient jumper you must follow a correctly prescribed plyometric jump program that titrates the optimal dosage of shock jumps. Any quality program should incorporate this movement. Only once drop jumps are mastered and landing mechanics are sound an athlete should move onto reactive plyometrics. Correctly prescribed volume of plyometric exercises are vital to vertical jumping success. A fairly high volume of plyo's are needed to create lasting neural pathways that are optimised for maximal explosion. However, with plyos there is a extremely fine line between optimal and over prescribed. Over prescription of plyometric exercises commonly leads to over-training injuries such as patella tendinitis and tendonosis. There are some aspects of your body that you can manipulate in order to get rapid gains in vertical jump height. One of the best things you can do is learn how to shift some body-weight fast. No vertical jump training program will get you vertical jump results as quick as shedding a few pounds will. Just losing a few pounds of fat can add inches to your jump. Imagine strapping a 5kg weight to your body right now and trying to jump. Your jump height would suffer right? So if you are overweight do yourself a favor and focus on losing the weight before doing anything else. Then come back to your jump training as a lean mean jumping machine. Excess weight can also add unnecessary strength to your joints and tendons. Remember force =mass x acceleration. The more mass you have the more force you will be applying to each of your jumps. This impact really adds up and overtime can lead to premature osteoarthritis and the end of your vertical jumping forever. In order increase your vertical jump height you must train with specificity. The opposite of specificity is diversification. Variety is the spice of life right? Well yes, but it can hinder jump performance. Simply put, if you want to jump higher don’t do long slow marathons runs. These will make you better at slow long runs. The art and science of prescribing co-current training is quite complex. Yes, it is possible to increase your vertical leap in season but you must adhere to a very well prescribed program that accounts for this. I hope this article has helped you learn how to increase your vertical jump height. Remember that vertical jumping mastery requires a consistent effort of intense and very specific exercises. Best of luck on your journey to a higher vertical jump. If you have any questions about any of the topics that we stated above please leave a comment below and we will get back to you asap.